These beauties were from Custom Scarfs Inc. in New York (215 West 40th Street if that means anything to anybody). They were also known as Wesley Simpson Custom Scarves. He was very a very influential designer of textiles, and was married to Adele Simpson. 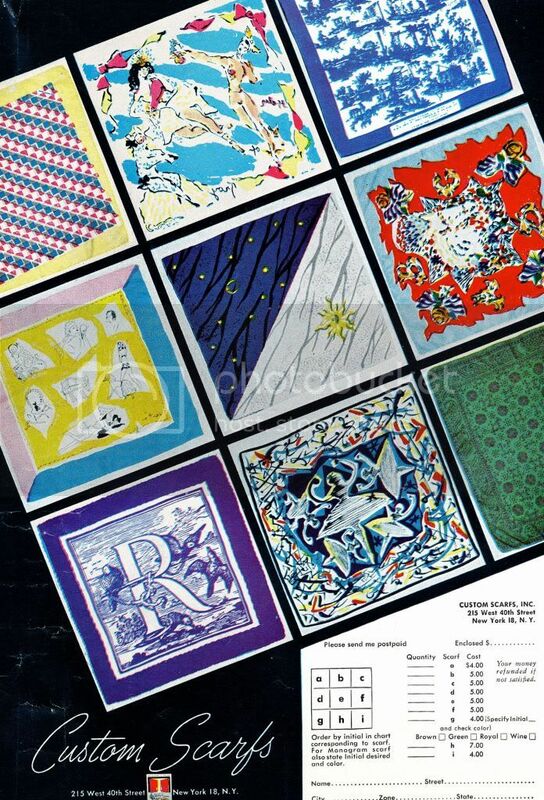 He commissioned famous artists and designers of the day for his scarves and other printed fabrics. In searching this company I found that Linus Pauling bought 2 scarves and one stole (he wrote a check). And there is another ad here from the Miami News. I wish we could see these clearer, or better yet, see them in person. It wouldn't it be great to match the scarfs with the designers? Any guesses? The top one in the middle appears to be Marcel Vertes. He is mentioned as one of the artist Simpson used so you are probably spot on. I love your blogspot. Really inspiring!!Thanks! The middle one is "Day and Night" by Peter Todd Mitchell. Bottom middle is "Ballerina" by Salvador Dali. Top right bears the following inscription - "In 1784, one J.B. Huet, an artist employed by the Oberkampf works located near Jouy, France, etched this design. This type of copperplate print, known as "Toile de Jouy" illustrates the various processes used in printing textiles". That's 4 down, only 5 more to go!